Intelligence, curiosity, and companionship are not words that most people associate with fish, but if you have worked with, or lived with a fish, you know this to be true. Fish are remarkably intelligent and complicated creatures. Many people don’t properly care for their fish because they believe fish don’t really have any awareness or intelligence. However, scientists have finally proven that fish are much smarter than what was commonly believed. Fish possess a surprising cognitive ability, and deserve to be treated with respect and compassion. 12 million households have companion fish. Fish have excellent senses of sight, touch, taste, and many possess an excellent sense of smell and hearing. 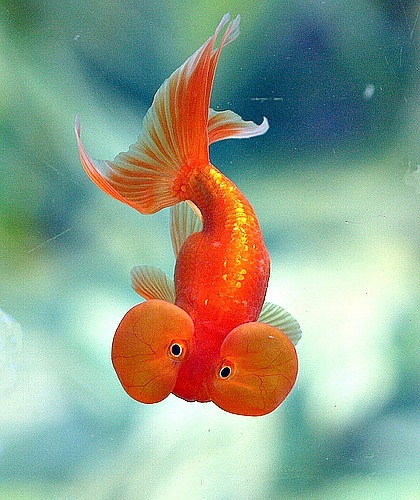 Tish, the oldest goldfish recognized by the Guinness Book of Records, lived for 43 years. Fish are able to solve problems by using tools. Researchers have discovered that certain fish can count. 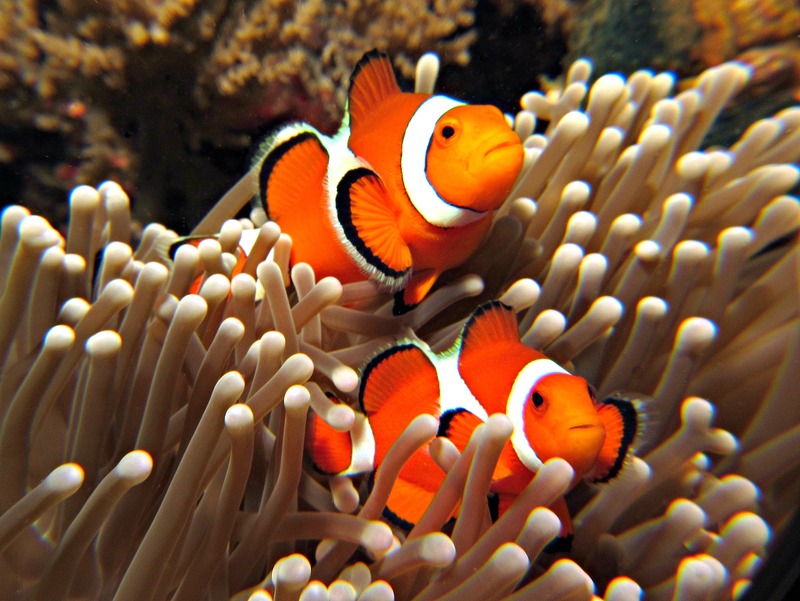 Fish have a memory that matches or exceeds those of nonhuman primates! 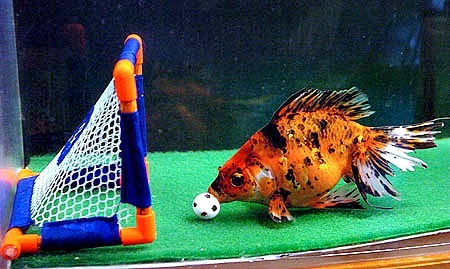 Fish can be taught to swim through hoops and tunnels, do the limbo, and even play basketball and soccer! Fish are socially intelligent creatures who do not deserve their reputation as the dim-wits of the animal kingdom, according to this study from a group of leading scientists. A growing body of research is showing that fish are far smarter than previously thought. Despite their small brain size fish have long term memories, social hierarchies, personalities, and are even capable of using tools. In the 2003 BBC news article “Scientists highlight fish ‘intelligence’” quotes biologists Calum Brown, Keven Laland, and Jens Krause as saying “fish are regarded as steeped in social intelligence” and that “fishes can even be favourably compared to non-human primates”. Rather than being driven purely by instinct fish are capable of learning, manipulating their peers, and co-operating in search of food. Cleaner wrasses have complex relationships with the animals in their environment. This species of fish can distinguish between other fish that cannot receive a “cleaning service” from another wrasse. This enables the wrasse to become the fish with the most clients! Dr. Culum Brown of the University of Edinburgh performed an experiment where fish were placed in mazes with different symbols marking different pathways. The correct symbols would lead the animals to food. After learning their way around the maze, the fish learned to use only the correct symbol to find food. Dr. Brown also observed that Australian crimson spotted rainbow fish were able to learn how to escape a net in their tank and remember how to do it again 11 months later. Dr. Brown compares this to a human remembering a lesson from 40 years ago. Fish have been observed using tools and building complex nests. Tool use could include using items in nature such as leaves to carry eggs. It could also involve human made contraptions. Psychologist Dr. Phil Gee says fish can learn to use a lever that will dispense food at various times of the day in the September 2003 University of Plymouth article “Teaching Fish to Tell Time”. Dr. Pasko from the University of Wroclaw observed a fish that used sharp rocks as an anvil to break apart pellets they were fed that were too big for them to swallow. Problem Solvers and Team Work! Scientists at the University of Cambridge performed a fish study. Fish were trained to leave their shelter – situated in the middle of the tank – to hunt for food that was placed at either the right or left side of the tank. Once the fish learned to expect where the food was, they paired two fish- one that scavenged at the right side of their tank and one from another tank that ate from the left side. They both wanted to go in opposite directions to scavenge, but didn’t want to be left alone and making themselves vulnerable. So they found a solution to their problem- they waited. One would follow the other fish to their preferred side of the tank while they both looked for food. Then, the other fish would follow the other one to the opposite side of the tank to look for food together. They each demonstrated a more complex, critical thinking approach to problem solving and team work! Fish are not mindless creatures simply following instinct. Rather they are capable of learning new skills, comparing behaviour, and making judgements. The University of St. Andrews writes in a June 2009 article “Common stickleback the ‘genius of the fish world’” that nine-spined sticklebacks are capable of watching other fish to compare behaviour and make choices leading to superior food supplies. This fish could be the first animal other than humans to display this social learning strategy. Research Jeremy Kendall notes that other animals are capable of copying behaviour, but making a determination of which behaviour has a higher payoff is unique. Fish do have a memory! Their ability to learn quickly enables them to perform behaviors similar to parrots, cats and dogs. As this video demonstrates you can learn to train your companion fish to do many fun behaviors. This helps to enrich the life of your companion fish and reduce boredom! 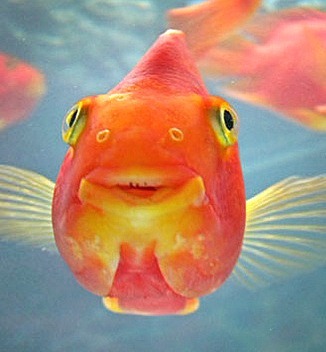 Lol clever fishes are very nice.